Extensive professional experience working in country house hotels saw Matt Weedon develop a highly assured, French-inflected style of cooking – a light, pared down take on the classics, with the emphasis on seasonal ingredients of the best possible quality. Earning multiple accolades (including Michelin stars at two of the restaurants he headed), he has now moved down a gear for his latest venture, The Bell in Hampton Poyle, Oxfordshire. Like many chefs, Matt Weedon left school aged sixteen, taking a summer job as kitchen porter at Pendley Manor in Hertfordshire with the assistance of his mother, Jenny. As well as cleaning dishes, he helped out with simple prep work and after showing an interest in cooking, he was offered a permanent post. This job signalled the beginning of a series of jobs working in country house dining, working his way up the hierarchy of several other country hotel operations, including Hambleton Hall in Rutland and a Relais & Châteaux establishment in Massachusetts, in the United States. Next was a position at Alan Murchison’s L’Ortolan in Reading, where during his tenure he mentored Will Holland, then a year at Kish, near Dublin. His first head chef job followed, at Seaham Hall in Durham. Matt was then appointed head chef of Glenapp Castle in southwest Scotland, where he won his first Michelin star, was awarded thee AA rosettes and was at the helm when it was named Scotland Restaurant of the Year by The Good Food Guide. His next position was at Lords of the Manor, nestled in the rolling hills of the Cotswolds, where he worked together with his wife Rachel, who assumed the role of restaurant manager. This job offered him the opportunity to really develop his own style of cuisine. Based on the French food he loves, but with a lighter, simpler take on the classics, Matt's dishes always begin with the best possible ingredients, many from local suppliers. He credits his culinary mentors for this outlook, all of whom were influenced by Raymond Blanc’s style of cooking at Le Manoir aux Quat’Saisons. Lords of the Manor gained its first Michelin star in 2009, only one year after Matt Weedon took over as head chef. In 2013, Matt joined Fallowfields Country House Hotel in Oxfordshire, taking up positions both as head chef and farm manager, with his wife working again as restaurant manager. Keen to expand his knowledge of food – beyond Michelin-star cooking and into animal husbandry and produce cultivation – he was involved in every aspect of the food. Still creating beautiful, accomplished, seasonal plates with the ultra-fresh ingredients he was now producing, he also reared forgotten pig breeds during his time there and achieved three AA rosettes for his efforts. In late 2014, the couple took over the tenancy of The Lamb Inn, in the Cotswolds, which they described as 'a relaxed, welcoming village pub with great service, ambience and creatively home cooked food, produced in our kitchen'. British-inflected dishes such as comforting sticky braised Oxford Sandy and Black pork cheeks with apple, mashed potato, onion rings and cider gravy really stood out during his time here, all washed down with real ales from the nearby Wychwood Brewery. As a member of Slow Food UK’s Chef Alliance, Matt's passion for Britain’s natural larder shines through his food. 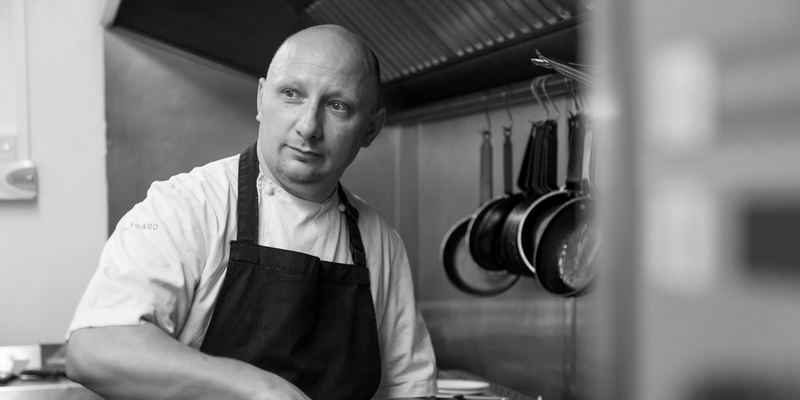 With many years of experience working in large and successful hotel-restaurant operations, Matt is now pouring his energy into his freelance consultancy business, and most recently became the head chef at The Bell in Hampton Poyle, Oxfordshire. If Matt weren't a chef, he would have been a professional pool player. His ultimate guilty pleasure is smoked bacon, crisp lettuce, garlic aioli in thick toasted white bread, along with 'the mother of all cappuccinos'.